(i had to split the post due to space limitation). Less and no transparent companies below. All the info about the most transparent companies is in the main post - see PART I.
Capella Flavor Drops use no Sugar, Splenda, Saccharine, Aspartame, Caffeine, Sodium, Potassium Sorbate or Animal ingredients of any kind. They say ‘We do not use Diacetyl in ANY of our flavorings’. They don’t add Sweeteners, Colors, Stabilizers or Preservatives. My opinion: Other flavor companies use questionable ingredients yet do not get near the heat that Flavor West does. Regardless of the past, after FW published their reports and changed their flavors i could say i trust them more than companies, who don’t release any info about their flavors publicly. 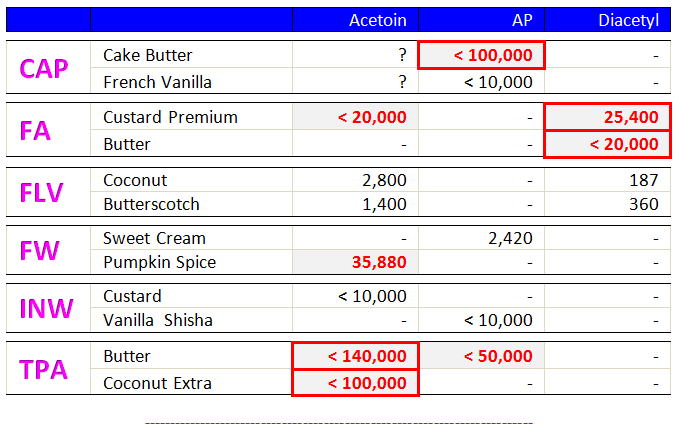 Listed are ONLY flavours with more than 10,000 ppm (>1%) of Acetoin. You can find more info about flavorings with diketones here. Their lab test reports are 3 years old. Note: Shown are only flavors with more than 100 ppm of D/AP. No lab reports and no their own website. Some flavors contain A and some flavors contain AP. No helpful information on their website about ingredients used, coloring, sweeteners, etc. One of the most popular companies SHOULD BE more transparent and customer friendly! Note: There might be other flavors that contain A and/or AP. You can find SDS of some most popular flavors on NicotineRiver. …but sadly, while probably great for business partners, they are one of the worst examples of non-transparent companies for customers. Other flavors such as French Vanilla Ice Cream or Australian Chocolate don’t contain DAAP. …but they don’t provide any lab test reports on their website and no information about Acetoin is found. Their eliquids, bases and flavours that do not contain any allergens and are gluten free, sugar free, GMO free and Nitrosamine-free. Their Tobacco e-liquids are Pesticides free. They work closely with Toxicology Labs of Medical School in University of Thessaly and Crete and they regularly perform toxicological analysis that go far beyond standard examination (TSNA, PAH, heavy metals, pesticides). Atmos Lab is the first ecig manufacturer in the world performed Chemical Analysis for Pesticides’ Residue in Eliquids with Tobacco flavours and all their Tobacco Flavoured Eliquids are Pesticides free. They say their e-liquid flavors are D-AP free. Customers have an access to NicTrace™, a lot/batch number tracking system, where they can view view all lab analysis and testing results (CoA) from an independent (third-party) certified laboratory. Several flavors contain oils, which are very bad for vaping. Several flavors contain artificial colorings, which are best to avoid. 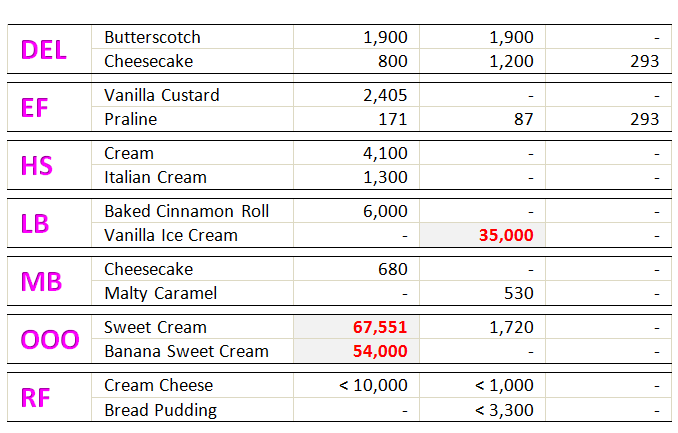 Be sure to check this table (note: it’s not LorAnn’s official and several flavors are missing here). Very limited info about AP in their flavors can be found here. Canadian company. Their website is here. Note: They had their lab test reports shown on their website, but they removed them (Aug 2017). I assume they are preparing new transparent information about DAAP levels in their flavors for their customers. Their flavors do not contain any Diacetyl. They say which flavors contain A and AP. They provide information which flavors are artificial and which are natural. They don’t provide any numbers and lab test reports. The following companies you should avoid if you care about diketones. They didn’t release any public report about diketones in their flavors, they either refuse giving any info or they say they will provide any MSDS sheets on a flavor if you email them (which is absolutely not enough; somehow i would rather see them publicly commit themselves with those reports, which they want to send me; also MSDS sheets often don’t give any information at all about DAAP levels). These vapers can’t find these information sorted in one place; if there is any other or better source, then please let me know. But it’s not just them. The info here is also useful for basically any vaper, including professionals, who are looking for the information about specific flavors, searching for specific chemicals which they like or hate, or for example finding out what cream is muting their flavor - all those can find these info at one place now, with links provided (i’m not sure if many vapers knew there are full lab reports, just like for TPA in past, available for several other companies now, like Hangsen, INW, RF. I know many experienced vapers were searching those tpa info occasionally in the past). But you’re right; this thread could be much more useful and interesting for many. Please help me with any advise about how to make this thread less confusing, more informational and overall better. You can also send me a PM. Thx for your reply. I agree with the title; it could be more precise about transparency thing. I chose this title to be more visible for those are searching these kind of information (it sounds better than “A study about how transparent vaping companies are?” - who would be opening that, right?). Besides, the inside info is what’s important and that’s exactly about what title says and that’s what vapers are searching. Still, if you have any idea how to make the thread better (or anyone else), then please share it. Let’s make it better and more useful. @Mikser Your efforts are very much appreciated. Question: what are the acceptable ppm for home and industrial settings. Is anything with <5000ppm AP “safe” according to our regulators or do they put the limit as <1000. I understand it all depends on what percentage of a flavoring you put in your recipe, I’m wonder where the ceiling should be set if the FDA decides to ban certain flavors. Perhaps they can limit the DAAP ppm in commercial ejuice without banning any specific flavors. Thx @MRA. Sorry for late reply. what are the acceptable ppm for home and industrial settings. Is anything with <5000ppm AP “safe” according to our regulators or do they put the limit as <1000. It depends who you ask. Pro-diketone group is surely not concerned of any levels, diketone concerned wants to limit the level of diketones and some wants to avoid them completely. Note that there is no scentific research showing that vaping diketones is harmful (it’s just a speculation that they might not be very healthy based on indirect evidences). Regulators don’t limit the level of diketones (yet); it is purely companies decision to make their flavors without DAAP (i’d say because of commercial reasons, but probably also to avoid any claims later if diketones are proved to be harmful someday). Personally, i am using many flavors with diketones and hardly any of my mixes is DAAP free. Overall i’m much more concerned about oils, sugars, syrups, aspartame, artificial flavoring, GMO in my flavorings. I understand it all depends on what percentage of a flavoring you put in your recipe, I’m wonder where the ceiling should be set if the FDA decides to ban certain flavors. Perhaps they can limit the DAAP ppm in commercial ejuice without banning any specific flavors. Imo DAAP levels are just an appropriate excuse to limit vaping. FDA is under huge pressure of mighty pharma and tobacco lobbies; ofc they don’t want you quit smoking and they are so powerful that can dictate the rules (see EU legislation and numerous other countries). What it can happen is they might try to ban D-AP in flavorings (like UK did, but it is not enforced thankfully) or overall ban of flavored liquids (like they banned flavored cigarettes). If this happens some flavors of some companies will be banned, but not many since most manufacturers are producing flavorings we vape for other uses (food; levels of DAAP are not important there and D-AP is completely safe to ingest; it means vaping D-AP flavorings will still be possible; see MF, NF, FA, LA for example). FDA won’t ban those and we will be able to buy them for our purposes. Third option is they could ban selling / importing e-cigarettes or ban vaping overall (like Thailand), which is unlikely since that would be a totally fascistic regulation. Thx @SuperFrog. I intentionally left mentioning Diacetyl-only in the table since the large majority of companies don’t use it at all. For transparency the manufacturer should list at least D+AP levels in their flavorings, so concerned vapers can avoid diketones (AP is very similar to D and many manufacturers use AP a lot). I understand it all depends on what percentage of a flavoring you put in your recipe. FLV Coconut flavor contains 2800 ppm of Acetoin (highest level of all FLV flavorings). So, when you use 1% Coconut in your solo mix (average quantity is up to 1% since FLV Coconut is super concentrated), that means 2800 ppm x 0.01 = 28 ppm (which is 0.0028%) in your liquid. TPA Coconut Extra is a different animal. TPA testing report says <10% (up to 100,000 ppm) of Acetoin in this flavor. TPA flavors are not concetrated, the average quantity by ELR users is 3.9% and the result is 3,900ppm of Acetoin in your solo mix (139 times more of Acetoin than in our Coconut FLV mix above). Ofc, in recipes you have to add levels of DAAP of each flavoring to get the approximate level in your mix. Several top rated recipes at ELR contain over 4000ppm of Acetoin for example (that much of Acetoin is uncommon for commercial juices these days). Was looking for D-A-AP information on VT (Vape Train Australia) and stumbled upon your thread. Good job! Glad to see you pursued this transparency topic and were not dissuaded by the enthusiasts. For now will be avoiding VT like the plague. A little confused as to why Kais Virgin Vapors is in this thread… Do they now manufacture their own flavors? Afaik theyre an eliquid maker only…? Thx @iVapeDIY. I really appreciate it. I will add an information about Great Lakes Flavour soon. Thx @netweight. You’re right there. I will delete Kai’s VV in my next update (long time ago i had an idea to include some popular manufacturers of finished eliquids, but you’re right there; it’s just more confusing). Thx for paying attention on this (and let me know if there are other confusing entries; i appreciate it). Thanks for this updated info. One of the vendors i use for flavours had the FA premium custard and FA whipped cream but they dont provide info on the products. I like to know what im buying!! MOST USEFUL IS: The July 3 Data Dump from the UK National Statistics showed that over the last 10 years prescription NRT have lost 75% of their sales and 65% of their income (price increase I guess) while during the same period of time vaping rose to 5.5% (?) and smoking declined to 15.5%… lowest ever. Also 1st time vapers (never smoked anything before) total 0.4% of the industry. Yes Big Pharma is unhappy. But I think the people who have tried their ‘successful’ tool (if you make 5+ attempts to be quit) will disagree and side with the 50+% successful former smokers who did so with Gen 2 & 3 devices. If the Lost Vape rumor about a pod kit with an evolve chip including RePlay comes to market they will have achieved something the FDA values in a standardized and approved cessation or harm reduction device… a simple one button option that delivers a given quantity of the special ingredient in a consistent manner. RePlay ("basic’) will only be offering the identical taste from pull to pull. Power and ingredients won’t change. Length of pull time is the single variable left to set and in NYS they choose 5 seconds for medical marijuana. This will likely be closer to the stand we will see available soon on starter devices. Things like this are what IQOS could not provide with enough harm reduction to get that seal of approval. BT won’t release much more than we have seen with GUSTO until they can go full barrels blazing on something that is finally (like NRT’s) not consider a tobacco product. (WHY? NICOTINE IS NICOTINE… SUE THEM FOR 'UNKNOWN or Small Business MANUFACTURER BIAS DISCRIMINATION REGARDING E-LIQUID). @Mikser DEL - Delosi website is https://delosilabs.com/. Btw (as a comment) their Acetoin/Acetyl Propionyl levels seems to be super low (if the flavours that you mention are the ones with the highest amounts).